As advances in medicine and technology lead to longer-than-ever average life spans, many states are expected to experience a shortage of licensed practical nurses. Missouri is no exception; job growth estimations show that the call for LPNs is slated to increase 16.4 percent by 2022, translating to a projection of more than 2,500 new positions state-wide. LPN programs have sprung up throughout the state, with options now available in both urban and rural areas. 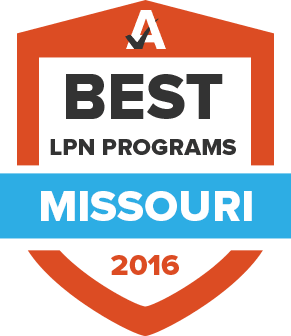 Learn about what it takes to become an LPN, what average salaries in Missouri look like, and begin your program search below. Whether considering a community college or career center, technical academy or vocational school, Missouri offers programs aimed at meeting the various needs of its students. The search tool below was designed to help prospective students narrow down their options and find the perfect program. Search schools by tuition, size and number of programs, and compare them side-by-side. Missouri takes pride in providing top notch heath services to its residents, and the state constantly works to ensure all healthcare providers are competent and knowledgeable professionals who excel at patient care. One of the main ways this is accomplished is by requiring all LPN candidates to go through a rigorous process of licensure. The following sections outline what it takes to become an LPN in Missouri. After completing a state-approved practical nursing program, graduates must start the process of receiving their license. Missouri allows students to work as graduate nurses after all degree requirements have been completed. This is allowed until a) the student has received their NCLEX results or b) 90 days have passed, whichever comes first. To move from graduate nurse to fully licensed practical nurse, candidates must complete the license application, have it notarized, and submit it to the Board of Nursing along with a $41 processing fee. They must also request for their school to send an official final transcript to the Board. After registering with a local Pearson Vue testing center for the NCLEX, students will receive an Authorization to Test form allowing them to sit the exam. Students are typically notified within two weeks after the test whether or not they passed. LPN licenses issued in Missouri expire on May 31st of each even-numbered year, with renewal reminders being sent out approximately 45-60 days prior. In order to renew their license, LPNs must fill out an online or paper application and pay a $50 renewal fee. The state does not mandate that continuing education credits be shown at the time of renewal. The annual mean wage for LPNs in Missouri sits just below the statewide average for all occupations, although practical nurses who are in the top percentiles of the industry can earn much more. Being in a metropolitan versus rural area can also have significant impact on salaries, as evidenced in the tables below. Although St. Louis or Jefferson City are the first places usually coming to mind when someone thinks of Missouri, LPNs are needed throughout the state. The following tables provide data about the rate of growth for LPN roles in various areas of Missouri and compares them to the national average of job expansion. The MO Board provides a helpful section of questions answered in topics ranging from education and fees to licensure and board regulations. Wondering about the differences between inactive and lapsed licenses, or what it means to have and keep an active license? All four types of licenses awarded in Missouri are explained on this website. Whether looking to check the status of your own license or review those of other practicing LPNs in the state, the Board provides an instant verification process through the Nursys system. Whether applying for license via endorsement or examination, from a different state, or outside the country, this list of documents and applications provides any form a prospective or current LPN may need. Prospective LPN students can use this list, provided by the Missouri Board of Nursing, to see the full list of 46 schools which have been approved for individuals seeking licensure. The MO Department of Health & Senior services offers loans to students looking to complete a nursing program, including LPNs. As of 2016, LPNs-in-training can receive a loan for $2,500 to help cover their educational costs. MONA works on behalf of thousands of nursing practicing throughout the Show Me State, with a range of advocacy efforts, conferences and member events, job postings, and details about continuing education credits. Compiled by the Office of Primary Care & Rural Health, this report highlights the state of nursing in Missouri and provides valuable data about the current workforce, including LPNs. This member organization hosts a variety of events throughout the year, provides educational and professional resources, and advocates on behalf of LPNs throughout the state. Prospective LPN students can also take advantage of scholarships provided by MSALPN. Wondering which schools have the highest rates of success when it comes to the NCLEX? This table, provided by the Board, highlights pass rates of all approved programs for the past five years.